As I figured, X code is not as easy to use as the Line creator's back end, but it shouldn't be, as Line is just for stickers and Xcode is for Applications. Once I started using Xcode and iTunes connect, I realized how Line copied a lot of things from Apple. Xcode gave me a warm time getting bundle identifiers and IDs right. All the little things that had to be done to get the app on the App store has a learning curve but it is not difficult. Honestly, there were a lot of things I wanted to do with the Geafus illustrations but I restricted myself to adhere to Lines guidelines. Now, with Geafus on iOS, I'm free to create the kind of illustrations I want. From weed nuggets to BIG HEAD SPLIFFS. With Geafus for iMessage, I put all the illustrations from the first Geafus animated and the unreleased Geafus animated 2, along with special animations I made just for iMessage. ( freedom is bliss). The idea for Geafus came about by me observing the emoji market in Japan and America. I realized the weed emojis on the market in America were difficult to use in everyday life. 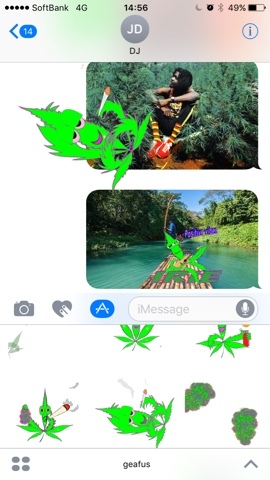 I also realized that the few weed emojis on the market were basically silly smiley faces that either had the munchies or were high. Not a lot of variety. I aslo observed how the Japanese made cute characters that people around the world liked, they also made witty humor with their expressions that could easily be used in communiction. So I fused what i observed and created what I thought a weed emoji should be. 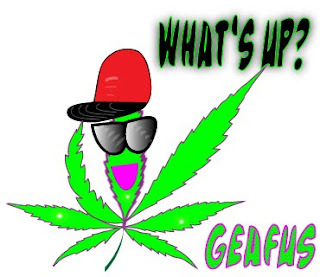 So now, Geafus is the only weed character that has his own sticker set, that's what makes "Geafus" unique. 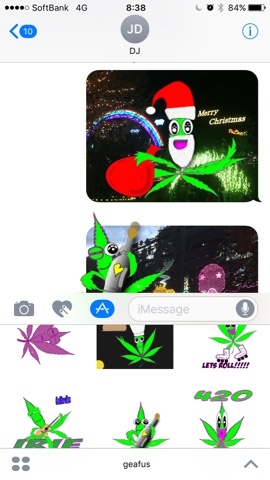 It's not just another weed emoji, but a brand and a character. Geafus Animated for iMessage consist of 47 animated stickers. 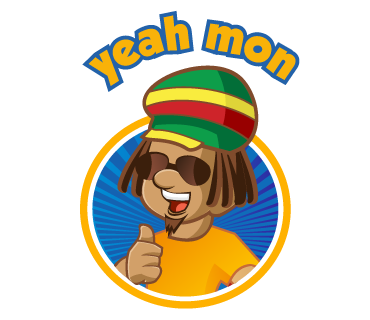 YES 47 animated stickers for a $1.99 and GUESS WHAT? I'll be adding new stickers quarterly at no extra cost. 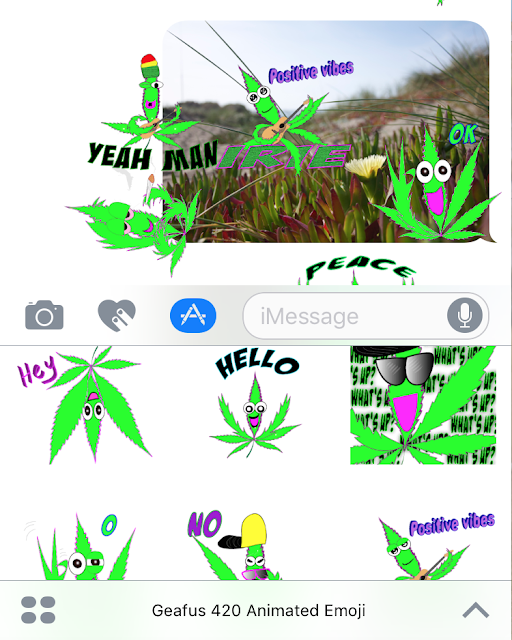 So once you purchase Geafus, your ganja library of animated stickers will grow like a weed field in California. Maybe I'm crazy for pricing Geafus so low and giving such huge value but I know how it is when buying apps. I'm always looking for the value and that's what I brought to you dear stoner. What I want you to do!! Since you actually took the time to read this blog, I'd like to say thank you from the depths of my green heart. Also if you haven't already, click the image or link below and download Geafus 420 Animated for iMessage and tell all your stoner friends about it. Lets make this baby viral and lets bring Geafus to life. Just imagine, a weed leaf character that's a household name. ( Imagine with me). A cartoon series, toys, cookies, cakes, etc. The possibilities are endless. Geafus is finally making his way to iOS. With 47 animated stickers well crafted for everyday communication, this is a set that the enlightened will not want to miss. 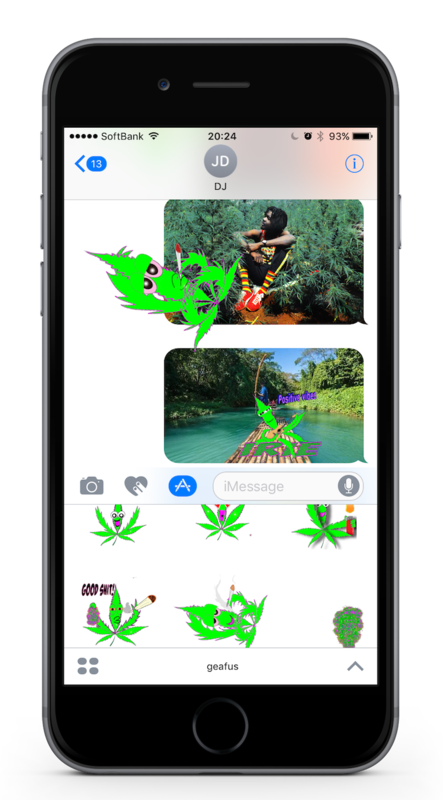 -Drag and drop animated stickers on pictures or text messages for a futuristic and blissful communication experience in iMessage. -Easy to use in everyday life. -Fun experience you will want to share with your friends. -Be involved in the creation of new stickers by commenting below. Sign up for a chance to win Geafus for iMessage free. 50 people will win, be the chosen! Offer Ends December 10th. Winners will receive a "Geafus" promotion code by December 21st via email.